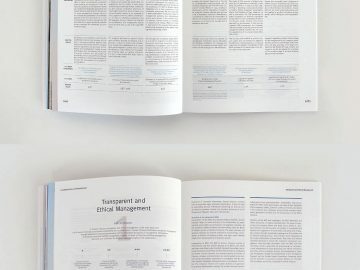 유한양행은 Progress & Integrity의 창업정신을 토대로 92주년을 맞은 전통의 기업입니다. 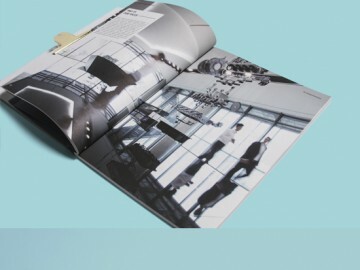 이러한전통과 신뢰를 뛰어넘어, 도전적인 신약개발과 신사업에 집중하고 있는 유한양행의 미래상을 어필하기 위한 연차보고서로서 Strategic Progress / Sincere Integrity의 섹션으로 구성하였습니다. 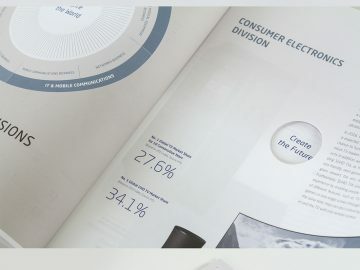 국내 1위의 오늘은 넘은 내일을 향한 역동성을 표현하기 위해 표지에서부터 미래지향적인 컨셉 비주얼과 투명홀로그램박 특수가공을 적용하였고, 네이비의 솔리드컬러가 적용된 삽지에도 레이저타공을 적용하여 미래를 향한 통찰력을 표현하였습니다. 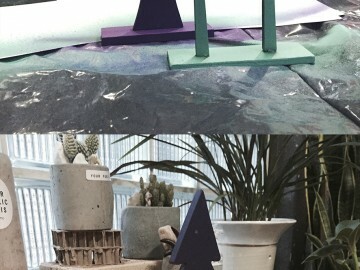 특수지, 특수가공, 삽지, 컨셉 비주얼 등 다양한 Creativity 요소를 시도하여 전체적인 디자인 완성도와 컨셉성을 높였습니다. 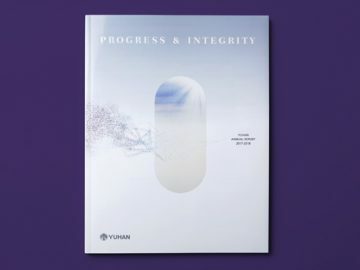 Yuhan Corporation’s founding vision of “Progress & Integrity” was first enounced at its establishment ninety-two years ago. 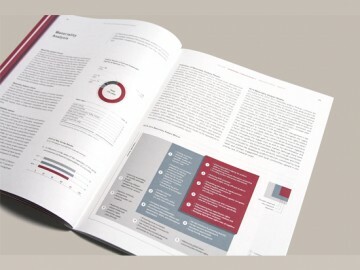 We have reflected it in this report’s “Strategic Progress” and “Sincere Integrity” sections, showing the company’s history of developing new drugs and starting up new enterprises. 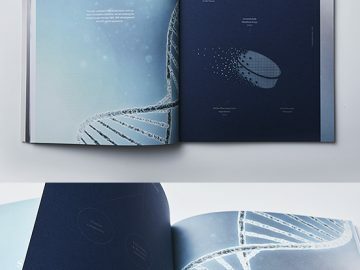 The cover features futuristic visuals and a transparent holographic foil, while inserts used laser punching and a bold navy color to reflect the company’s dynamism and its faith in the future. 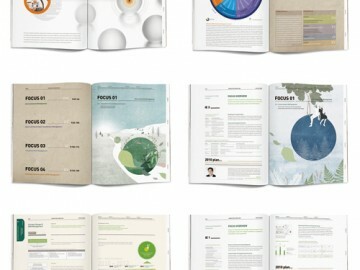 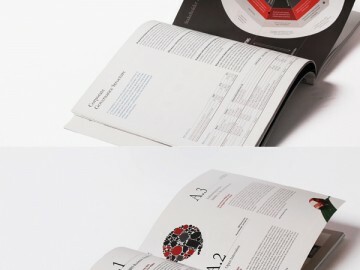 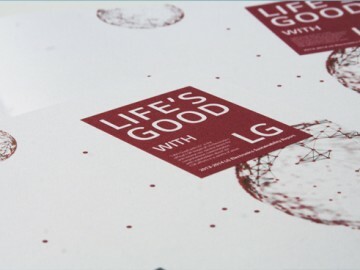 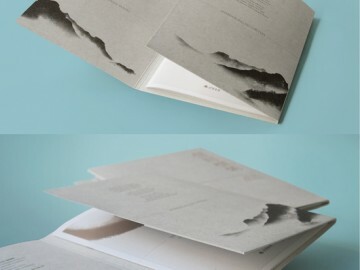 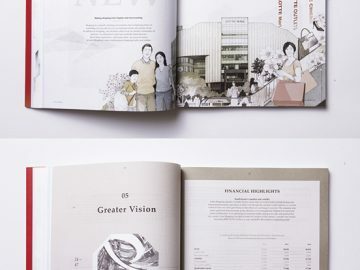 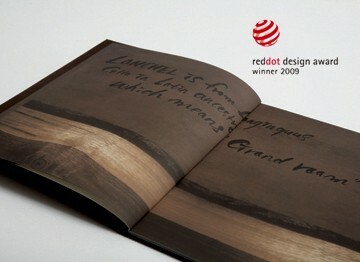 The book’s overall design and concept have been further enhanced through various elements, such as special paper, processing, inserts, and visuals. 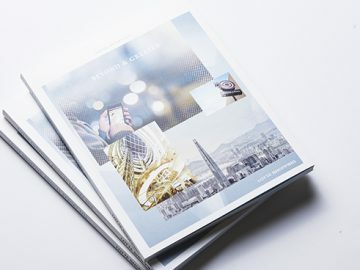 현대자동차의 브랜드 스토리와 혁신 역량을 전달하기 위한 PR Brochure로서, 브랜드 슬로건인“Modern Premium”이 내포한 프리미엄 감성을 고객에게 전달하기 위한 미래전략과 실행노력, 브랜드 가치를 <Tomorrow of Mobility>, <Enhancement of Mobility>, <Encounter with Mobility>의 섹션으로 스토리텔링하고 있습니다. 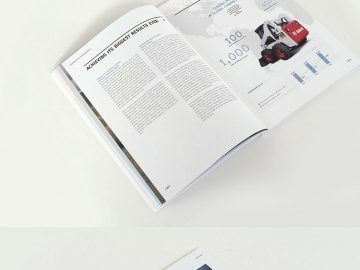 브랜드 컬러 Hyundai Sand와 블루 그라데이션 포인트 컬러, 절제된 레이아웃과 임팩트 있는 Full cut image, 하이테크한 표지 후가공(투명홀로그램박)과 심플한 특수지 삽지 등 다양한 요소들의 조화로 현대자동차의 프리미엄 감성과 미래지향적 기술을 컨셉적으로 전달하고 있습니다. 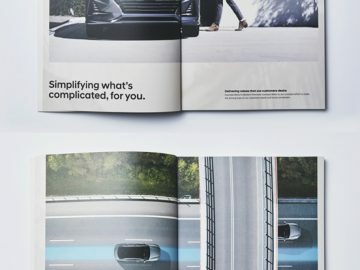 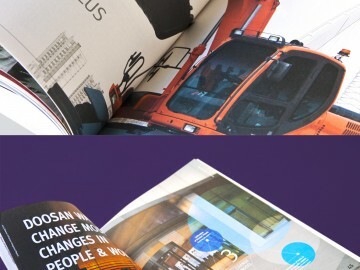 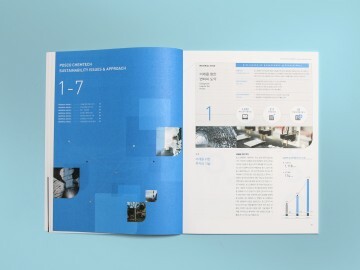 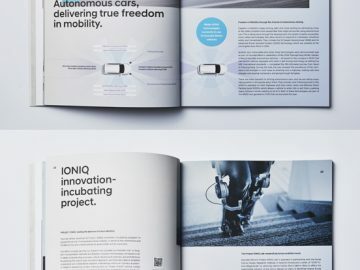 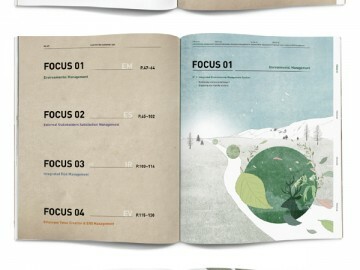 This brochure tells readers about Hyundai Motor’s brand story and its innovation abilities. 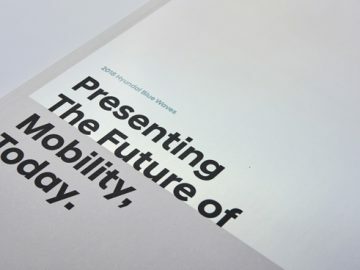 Its three sections, “Tomorrow of Mobility”, “Enhancement of Mobility”, and “Encounter with Mobility”, outline the company’s strategies and initiatives for the future and how the company’s “Modern Premium” motto enhances its brand value. 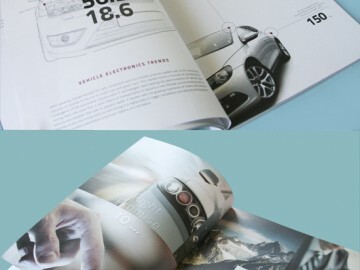 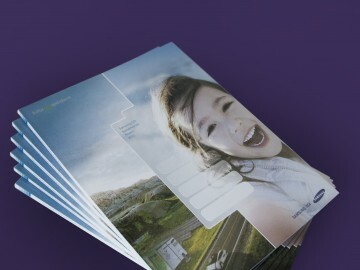 These topics are enlarged upon in such areas as the Hyundai Sand brand color, the blue gradient point colors, an understated layout, and a series of full-cut images, as well as through the high-tech post-processing of the cover using transparent holographic foil and various inserts using a specialized type of paper. 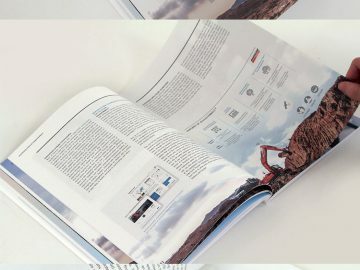 롯데쇼핑은 전 생애주기에 걸쳐 고객에게 최고의 가치를 선사하겠다는 의미의 “Lifetime Value Creator”를 새로운 비전으로 수립하였습니다. 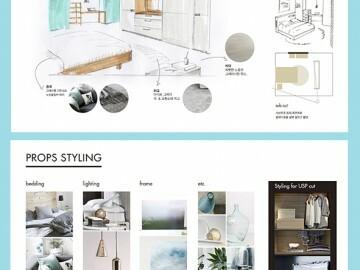 새로운 비전을 통해 전달하고자 하는 “New Value”를 트렌드를 선도하는 “새로운 가치”, 기술을 선도하는 “새로운 가치”, 신유통문화를 선도하는 “새로운 가치”의 스토리에 고객 경험을 직관성 있게 표현한 이미지로 구성하여 롯데쇼핑의 변화와 역량을 임팩트 있게 전달하는 연차보고서입니다. 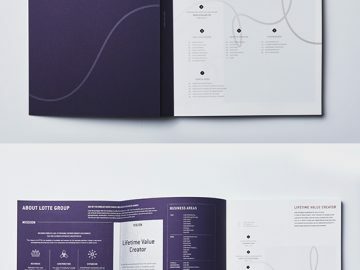 CI 컬러인 Lotte Red를 적용한 “Value Line”에 창의성과 신비로움을 표현하는 2018 트렌드컬러인 Violet의 과감한 적용, 표지 특수 후가공과 컬러 트레싱지 삽지 등으로 독자의 감성과 이성 포인트를 조화롭게 자극하고 있습니다. 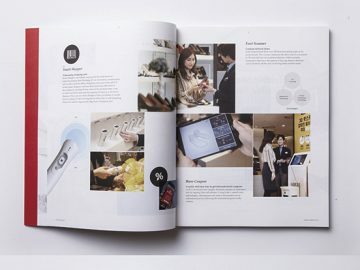 Lotte Shopping’s vision is to be a “Lifetime Value Creator”, offering customers the highest possible value with every purchase they make. 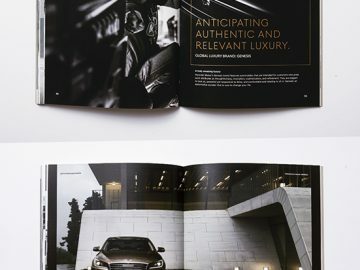 This vision is reflected through detailed and informative stories about the industry-leading values that the company represents in such areas as shopping trends, technologies, and the development of a new retail culture. 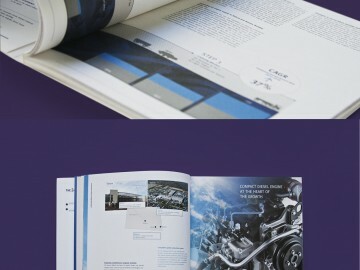 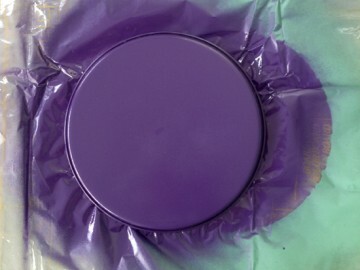 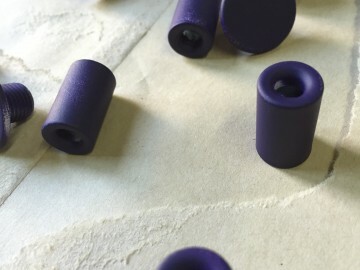 This annual report stimulates the reader’s interest through the bold application of the color violet (meant to express creativity and mystery), as well as through the specialized post-processing of the cover, the use of the “Lotte Red” CI color, and inserts employing color tracing paper. 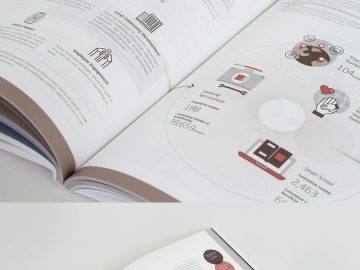 2016년 애뉴얼리포트에는 오늘의 유통을 넘어 내일의 유통을 만들어가는 롯데쇼핑의 새로운 생각과 과감한 도전을 상세히 담았습니다. 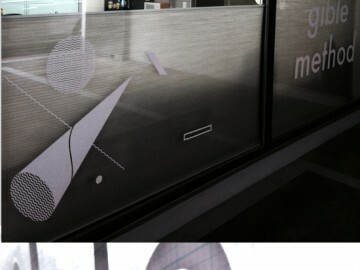 ‘Beyond’ 파트에서는 미래의 유통을 창조하는 노력을, 섹션별로 정리한 ‘Greater’ 파트에서는 재무적·비재무적 경영 성과를 전달하였습니다. 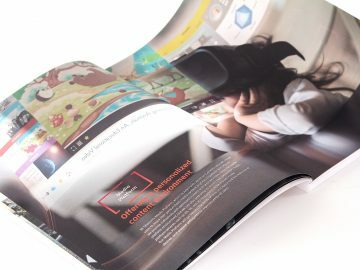 특히 ‘Beyond’ 섹션은 임팩트 있게 촬영한 이미지와 컨셉 이미지, 일러스트레이션, 그래픽 모티프 등 다양한 시각적 요소를 컨텐츠별 성격에 맞게 조화롭게 사용한 매거진 스타일로 롯데쇼핑이 만들어가고 있는 내일의 유통을 직관성, 이해도 있게 표현하였습니다. 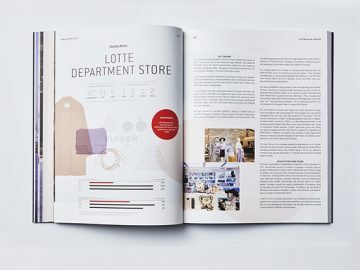 This annual report is designed to inform readers about Lotte Shopping’s exciting and innovative new ideas in the retail industry of today and tomorrow. 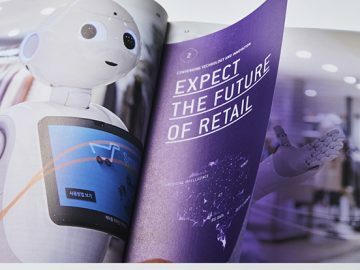 This year’s report includes a “Beyond” section outlining our efforts to create the retail industry of the future and a “Better” part that describes our financial and non-financial management performance and our activities in the area of corporate social responsibilities. 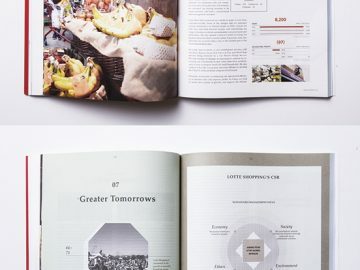 The section titled “Beyond” draws upon a magazine style, with various visual elements such as high-impact photographs, conceptual images, and graphic motives, in order to create a strong intuition-based impact. 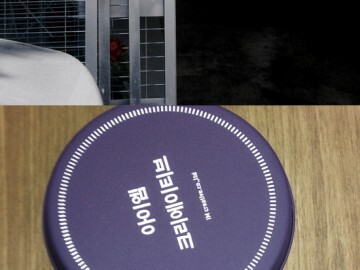 현대자동차의 브랜드 슬로건인 “Modern Premium”을 향한 모든 <Motion>들이 고객 삶의 모든 <Moments>에 기여하고자 함을 컨셉으로 <Meeting Modern Premium, Experiencing Modern Premium, Anticipating Modern Premium>의 섹션으로 스토리 구조를 만들었습니다. 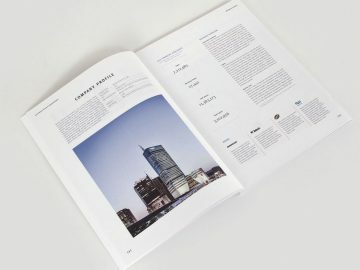 브랜드 가치의 구체적인 표현을 위해 표지부터 전반부 Narrative 섹션까지 Brand Grid System을 적용하였으며, Brand Manifesto를 고객 삶과 연결시킨 내용을 전반부에 구성하였습니다. 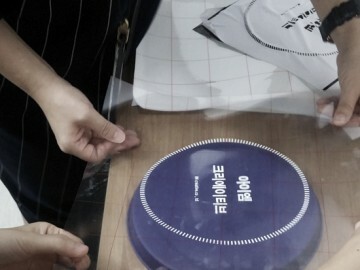 Hyundai Sand 컬러를 main으로 <Motion>을 표현하는 다이나믹한 이미지 & 기하학적 그래픽과 <Moments>를 표현하는 감성적인 이미지 & 카피로 전체적으로 조화롭게 구성하였습니다. 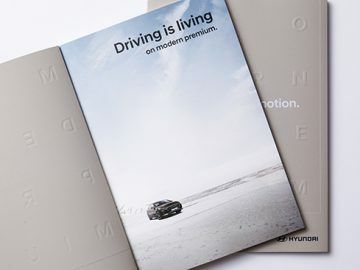 Hyundai Motor’s brand slogan is “Modern Premium”. 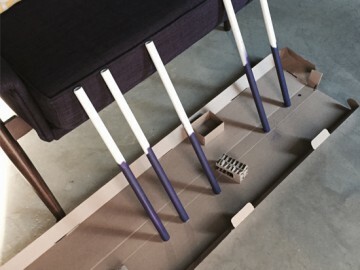 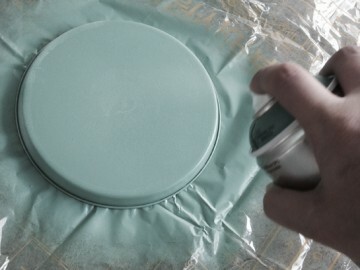 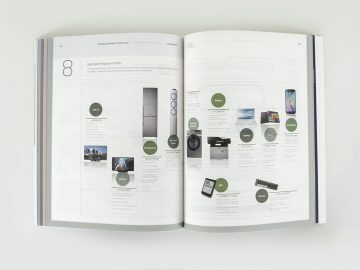 The purpose of the various “Motions” included in the brochure is to show readers how various facets of the company’s products fit into their everyday lives. 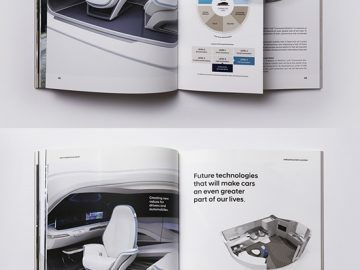 This is also why the brochure is divided into three sections: Meeting Modern Premium, Experiencing Modern Premium, and Anticipating Modern Premium. 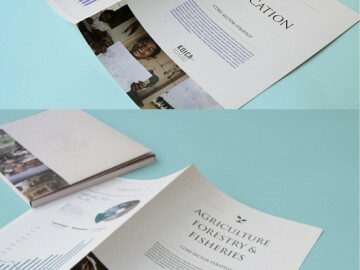 We used the Brand Grid System in the first half of the brochure (which ranges from its cover to the Narrative section) to make specific representations about our brand value. 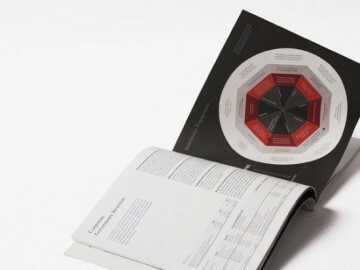 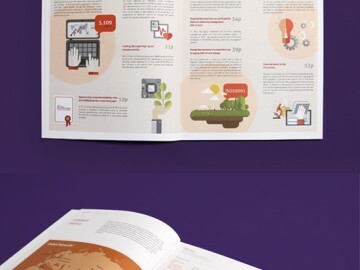 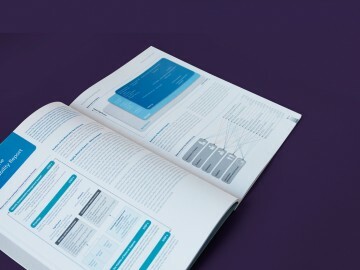 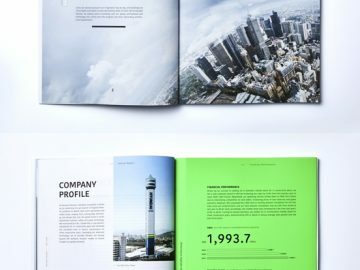 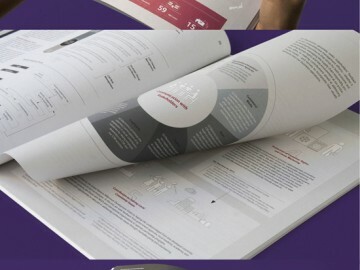 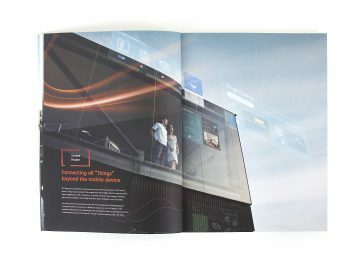 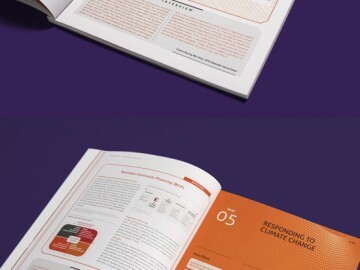 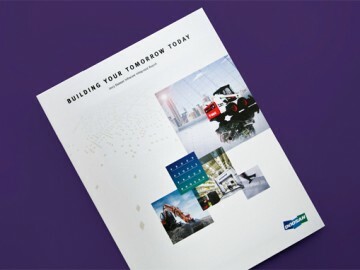 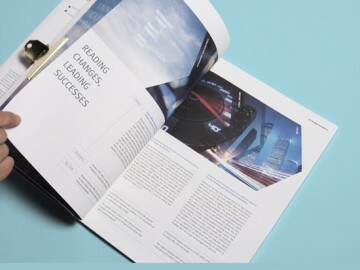 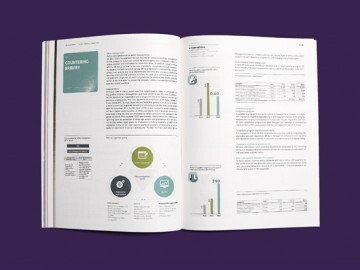 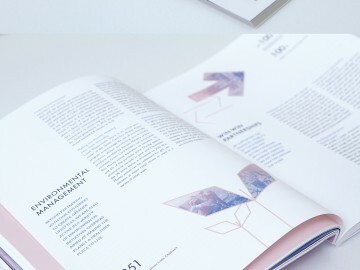 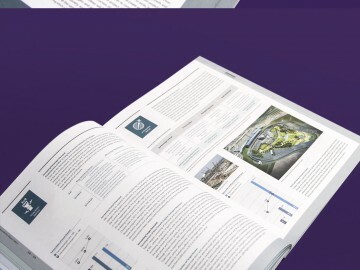 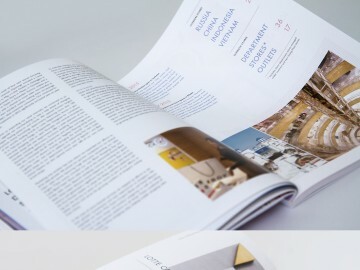 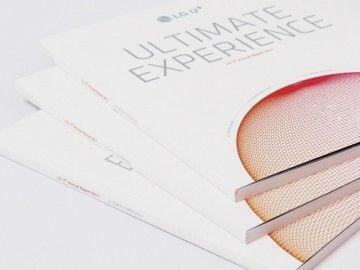 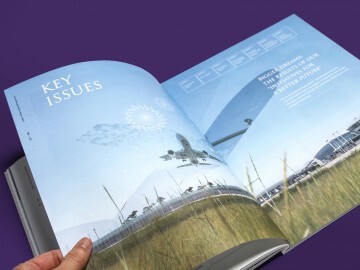 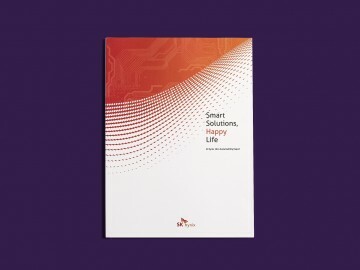 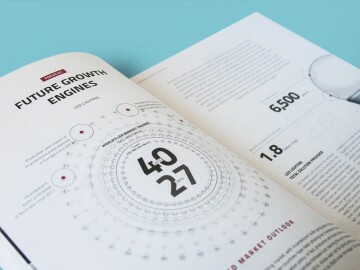 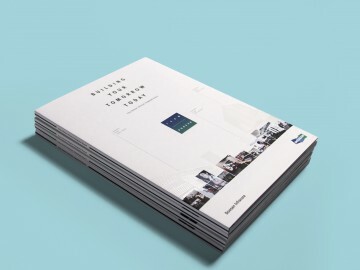 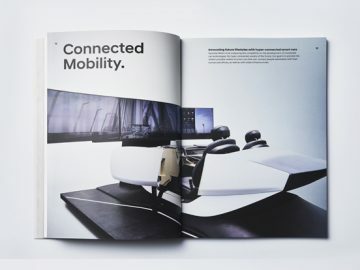 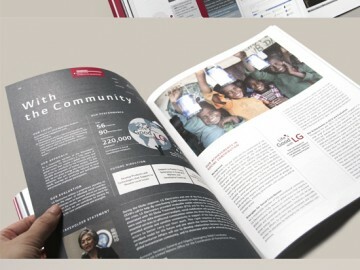 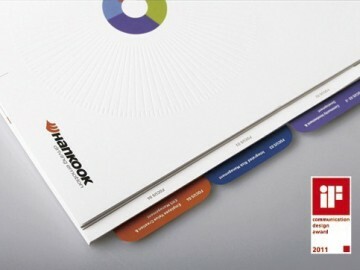 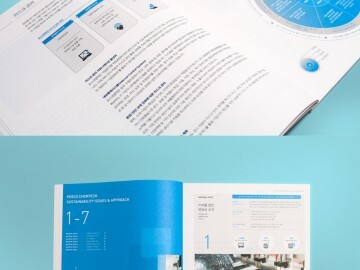 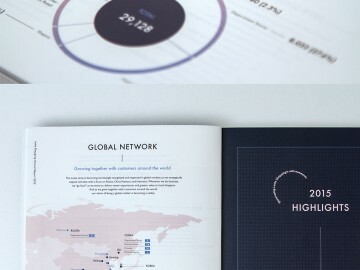 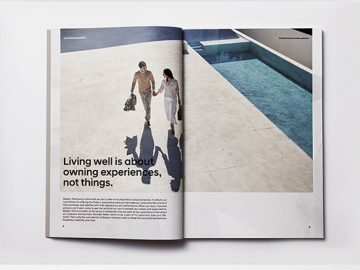 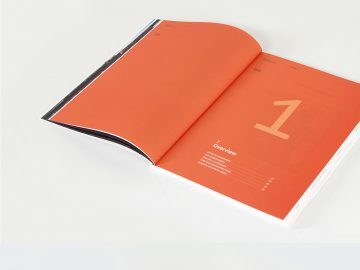 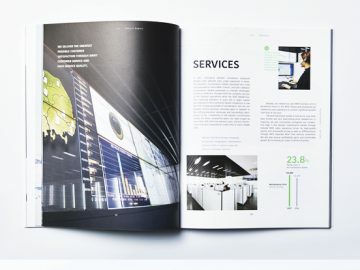 We also included content in the first half of the brochure that connects the company’s Brand Manifesto with the day-to-day lives of our customers. 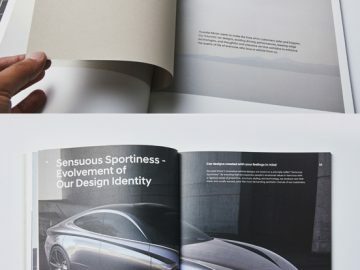 We chose Hyundai Sand as our main color to ensure that the brochure had a feeling of harmony to it, using dynamic images and geometrical graphics to make readers think of “Motion”, while emotional images and text were deployed to express the concept of “Moments”. 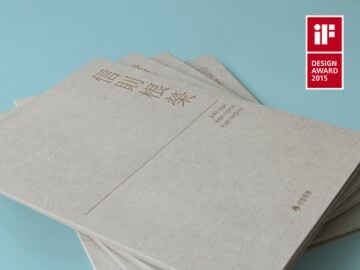 올해로 LG전자는 10번째 지속가능경영보고서를 발간했습니다. 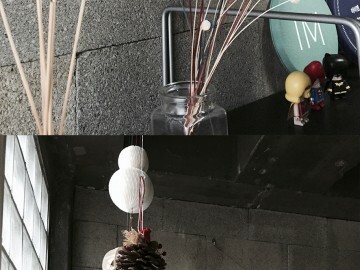 그간의 노력과 소통과정을 더욱 진정성있게 전달하기 위해, 표지에는 이해관계자를 향한 감사와 다짐의 메시지를 구성하였고, 표지 날개면에 10년 간 LG전자의 지속가능경영 및 지속가능경영보고서의 발자취를 요약 구성하여 매년 발전하고 개선되는 변화상을 표현했습니다. 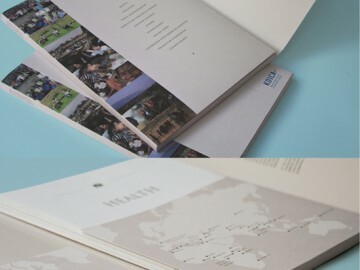 또한 전반부에 그래픽 화보를 구성하여 10년간 경제, 환경, 사회 각 분야별 성장을 표현하여, 과거로부터 오늘까지의 성장, 그리고 이를 기반으로 한 향후 10년간의 성장을 위한 약속과 다짐의 내용을 전달하였습니다. 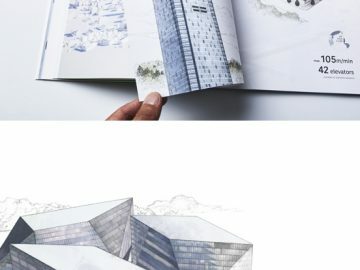 저체도 그린, 그레이와 LG레드의 컬러 조합으로 진중하면서도 세련된 톤앤매너를 형성하였고, 3단 그리드를 기반으로 텍스트와 이미지, 다이어그램과 도표를 율동적을 배치하여 자칫 딱딱할 수 있는 보고서의 가독성을 제고함과 동시에 리드미컬한 구성력을 부여하였습니다. 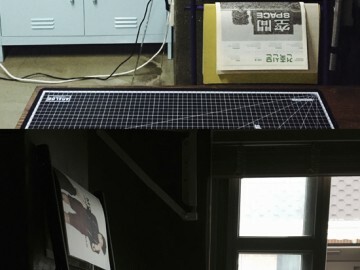 삼성전자가 추구하는 지속가능경영은 사람과 사회 그리고 환경이 조화롭게 공존하고 함께 발전하는 것입니다. 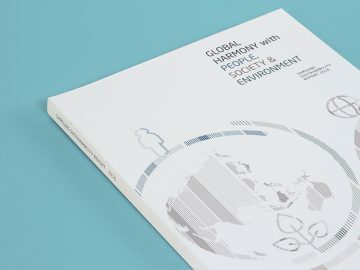 이러한 ‘Global Harmony with People, Society & Environment’의 가치를 컬러와 그래픽이 조화롭게 구성된 심플한 톤앤매너로 표지에서 전달하고자 하였습니다. 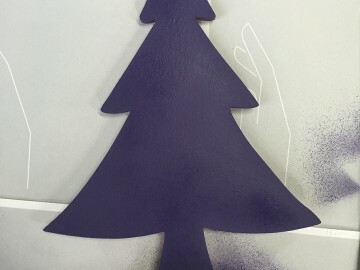 또한 “인재와 기술을 바탕으로 최고의 제품과 서비스를 창출하여 인류사회에 공헌한다”는 경영이념 하에 전개되고 있는 사람, 사회, 환경을 포괄하는 10개 영역에서의 삼성전자의 활동을 세분화된 라인들이 조합되어 완성된 형태를 만들어가는 움직임을 통해 표현하였습니다. 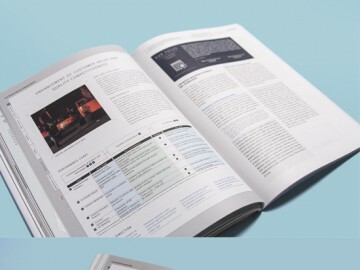 이 그래픽을 사람, 사회, 환경 3개 섹션의 게이트 페이지에 적용하여 보고서의 비주얼 통일성을 부여하였으며, 저체도 컬러와 세밀한 라인 그래픽, 그래픽 일러스트를 전체적으로 조화롭게 사용하여 글로벌 선도 전자기업으로서의 업과 위상을 표현하였습니다. 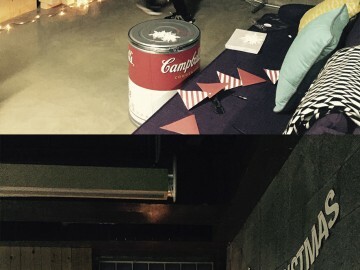 SK텔레콤의 재무적 실적뿐만 아니라 미래 전망, 비재무적 성과와 그 저변의 가치 제고 노력을 포함한 종합적인 가치창출 스토리를 담고자 한 SK텔레콤의 통합 연차보고서(Integrated Annual Report)입니다. 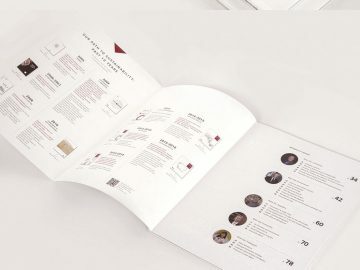 네트워크 진화를 통해 통신 사업을 선도하며 세상을 새롭게 바꿔온 SK텔레콤은 이동통신 회사에서 한발 더 나아가 혁신적인 가치와 감동을 선서하는 차세대 플랫폼 회사로 성장하고자 합니다. 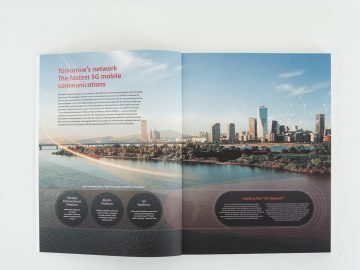 5G 네트워크를 기반으로 SK텔레콤이 추구하고 있는 생활가치 플랫폼, 미디어 플랫폼, 스마트홈, IoT 플랫폼, 그리고 이를 통한 생활의 변화상을 직관적이면서도 임팩트 있게 전달하기 위해 전반부에 라이프스타일 기반 이미지와 컴퓨터 그래픽의 결합으로 표현한 Image Narrative를 구성하였습니다. 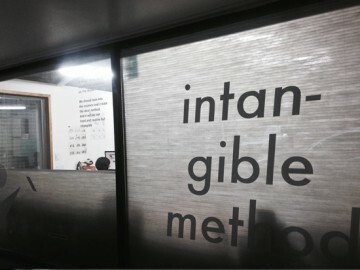 표지에는 최근 유통산업의 혁신과 변화를 이끌고 있는 롯데쇼핑의 옴니채널 전략과 이를 통해 실현되는 ‘Lovely Life’를 상징적으로 표현하였습니다. 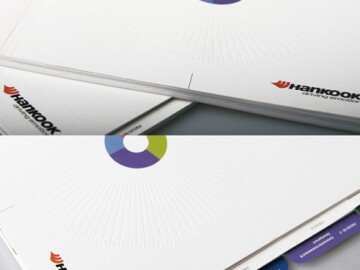 또한 롯데쇼핑이 선사하는 특별한 경험과 감동을 감성적인 컬러 톤으로, 롯데쇼핑이 이뤄가는 혁신과 변화를 야광 잉크의 타이포로 각각 표현하여 주목성과 차별성을 부각했습니다. 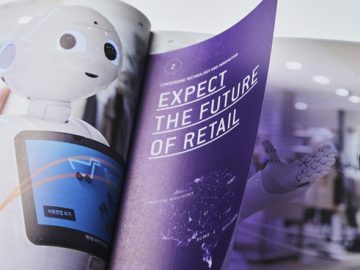 유통의 책임을 실천하기 위해 롯데쇼핑이 창조하는 ‘Smart Retail’, ‘Special Retail’, ‘Valuable Retail’을 임직원들의 이야기로 진솔하게 전달하였습니다. 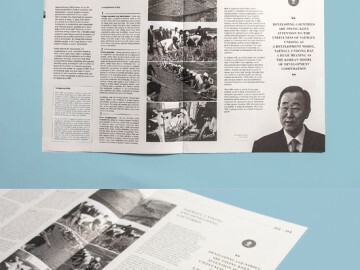 코이카는 1970년대 한국의 성장과 발전을 성공적으로 이끈 포괄적인 지역사회개발 프로그램인 < 새마을운동>을 해외 파트너국으로 전파하는 활동을 하고 있습니다. 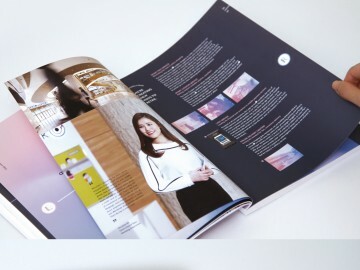 Smart Saemaul Undong으로 명명된 이 활동은 지역상황에 맞는 인프라 구축과 농어촌지역 소득 증가, 건강증진 등 다양한 활동을 실행하고 있으며, 이러한 내용을 알기 쉽게 소개하고자 브로슈어를 제작하였습니다. 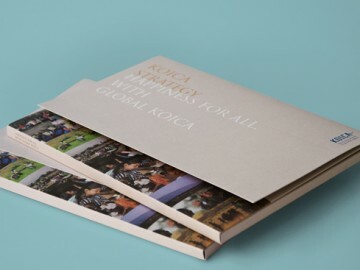 KOICA is engaged in the spread of Saemaul Undong, a comprehensive local community development program that emerged in Korea in the 1970s, to its partner countries. 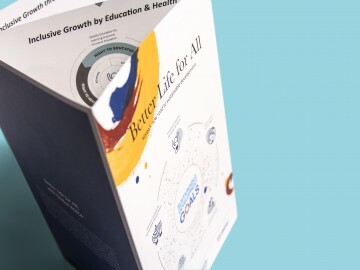 The program involves diverse activities aimed at establishing infrastructures in local areas, increasing the income of rural households, and promoting healthcare. 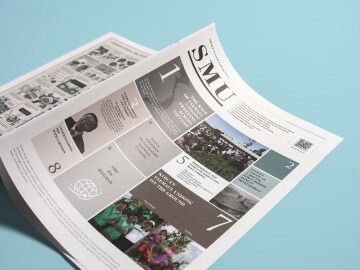 Success examples, distribution status, and positive outcomes in each country are presented in tabloid format to enhance understanding and readability. 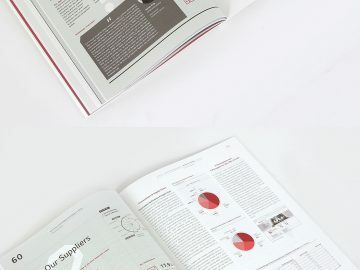 Each section is designed differently using images, typography, graphs and cartoons to maximize the diversity and attractiveness of the tabloid-format publication. 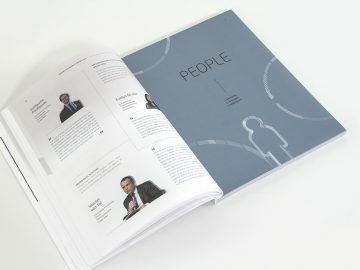 두산인프라코어의 재무/비재무 성과를 균형있게 보고하고자 하는 세 번째 통합보고서입니다. 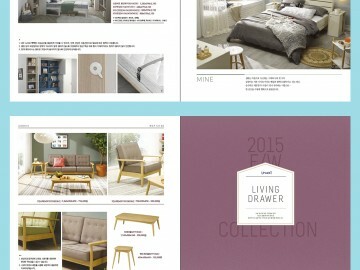 2014년 글로벌 주요 거점(한국, 북미, 유럽)에 연구개발 센터를 건립하여 최고 품질의 경쟁력 있는 제품 개발을 위해 R&D 역량을 강화하고 있는 두산인프라코어의 활동을 역동적으로 표현하기 위해 표지에 각 연구개발 센터의 전경과 활동 이미지를 후가공(펄박)과 결합하여 배치하여 임팩트 있게 표현하였습니다. 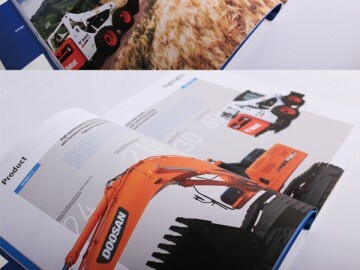 The progress Doosan Infracore has made – including the enhancement of its R&D competence by establishing R&D centers at its key global business bases in 2014 – is depicted dynamically with a frontal view of the building and images presented in an emphatic style. 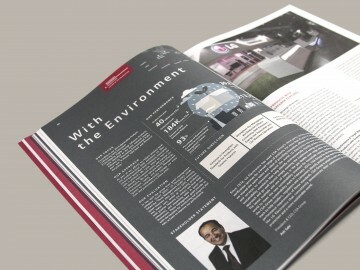 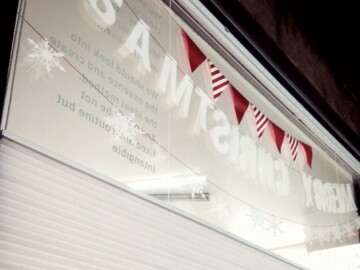 The company’s business strategies for coping with global mega trends are presented in the intro Global Megatrend! 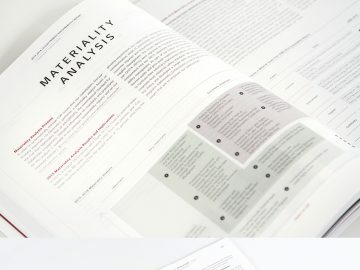 Risk or Opportunity? 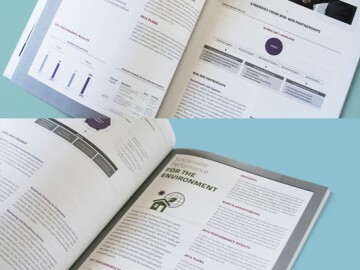 while the activities for implementing each strategy are presented in the Our Strategic Performance section. 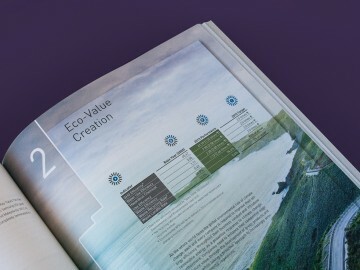 To enhance the overall balance, various visual elements such as high-impact photographs, conceptual images, and graphic motives are used. 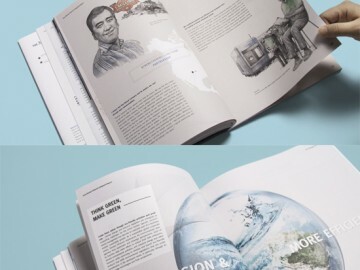 한국의 자본시장 시작부터 함께 해 온 신영증권은 전통성을 지키며, 신뢰가 곧 번영의 근간이라는 ‘신즉근영(信則根榮)’의 경영이념 아래 가치투자철학과 정도영업을 실천하고 있습니다. 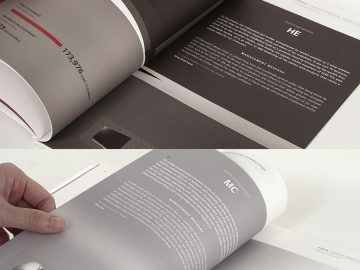 이 ‘신즉근영’의 이념을 한자 typography로 메인 타이틀화하고 전통닥지 질감과 느낌의 용지사용, 수묵터치의 그래픽 사용 등으로 전체적으로 한국적이고 전통적인 톤앤매너를 형성하고자 했습니다. 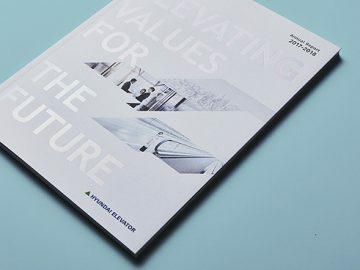 We have tried to emphasize the company’s heritage as one of the trailblazers of the country’s capital industry since the onset of its capital market, and maximize the impact of the company’s management philosophy, namely, Shin-Jeuk-Geun-Young (or “Trust is the Foundation of Prosperity!”). 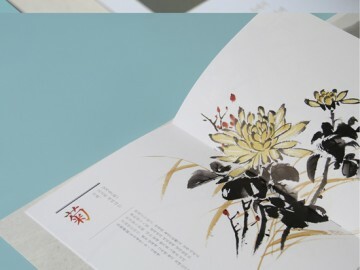 We have set our corporate philosophy of ‘Shin-Jeuk-Geun-Young,’ written in Chinese characters, as the main title and attempted to imbue the report with a decent tone and manner based on the traditional Korean sense of beauty, which is represented by the texture of traditional Korean paper, graphics expressed with ink-and-water painting techniques, traditional Korean paintings, and poems written in Chinese characters during the Joseon Dynasty. 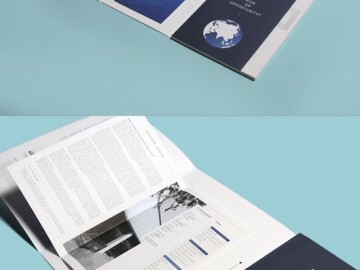 We have published the company’s ‘Profile’ and ‘Financial Report’ in two books, and bound them in a single folder to maximize readers’ comfort and convenience. 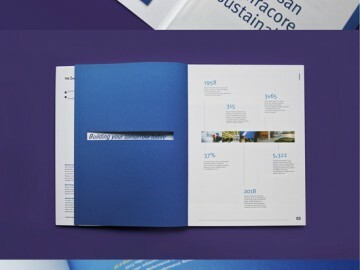 We have tried to emphasize the company’s heritage as one of the trailblazers of the country’s capital industry since the onset of its capital. 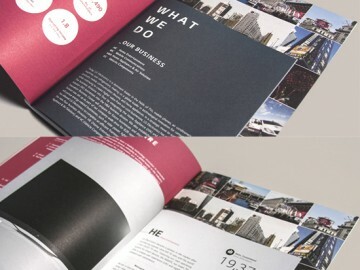 We have set its corporate philosophy of ‘Shin-Jeuk-Geun-Young (Trust is the Foundation of Prosperity),’ written in Chinese characters, as the main title and attempted to imbue the report with a decent tone and manner based on the traditional Korean sense of beauty, which is represented by the texture of traditional Korean paper, traditional Korean paintings, and Korean ancient poem. 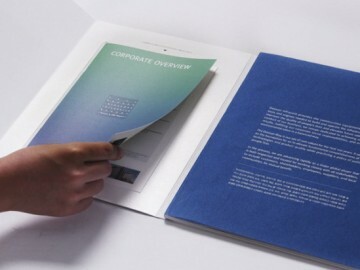 And we have published the company’s ‘Profile’ and ‘Financial Report’ in two books, and bound them in a single folder. 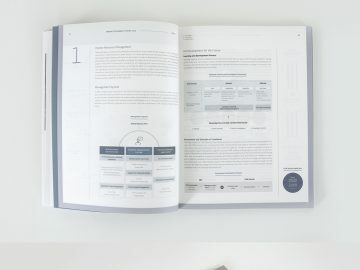 두산인프라코어의 재무/비재무 성과를 균형있게 보고하고자 하는 두 번째 통합보고서입니다. 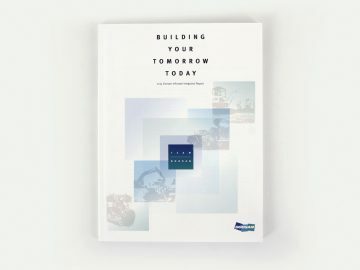 표지에서는 ‘Building your tomorrow today’라는 슬로건 하에 ‘근원적 경쟁력 강화’를 위해 정진하고 있는 두산인프라코어의 각 부문 활동을 표현한 이미지를 글로벌 기업으로서의 역동적인 비즈니스 움직임과 이를 확산, 공유하고 있는 CSR 가치를 후가공(펄박)으로 배치시켜 지속성장을 향한 움직임을 표현하였고, CI 심볼 형태에서 차용한 사각형을 적극적으로 활용함으로써 기업 identity를 전달하고자 하였습니다. 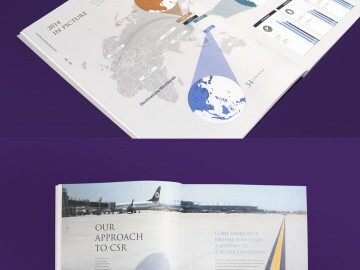 한국타이어 CSR REPORT 2009는 ‘A new way to drive’ 컨셉 아래, 체계적이고 진정성이 담긴 성과를 이끌어내기 위한 CSR 실천의지를 담았습니다. 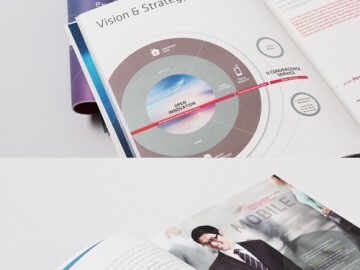 진정한 CSR을 위해 어제, 오늘 그리고 내일도 쉼 없이 질주하며 한 차원 발전된 신개념의 CSR Way를 제안합니다. 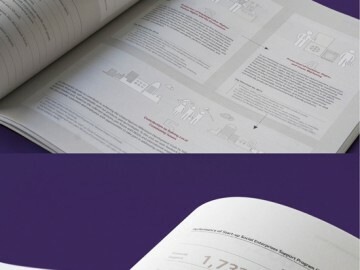 가장 작고 근본적인 것에서 시작한 한국타이어의 CSR은 다양한 이해관계자와 소통하고 약속을 실천함으로써 함께 성장하며 새로운 미래를 열어가겠다는 CSR WAY를 밝히는 Narrative를 전개하였습니다. 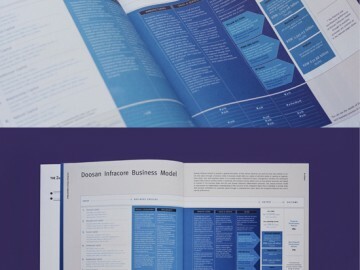 회사전반에 대한 소개와 CSR 통합체계, 그리고 이해관계자들의 중대성 이슈인 FOCUS 1, 2, 3, 4를 계단식 제본으로 명확하게 구분하였습니다. 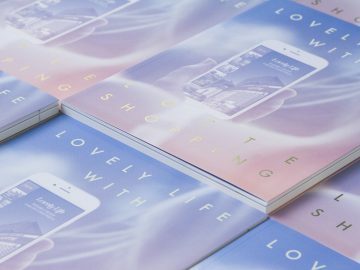 아울러 포커스는 PRIVATE TAB을 적용하여 가독성과 독자 편의성을 적극 고려하였습니다. 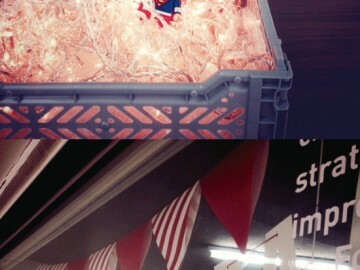 각각의 중요 이슈들을 함축한 감성적 일러스트를 Gate Page에 담아 한국타이어가 가고자 하는 CSR를 보다 명확히 표현했습니다. 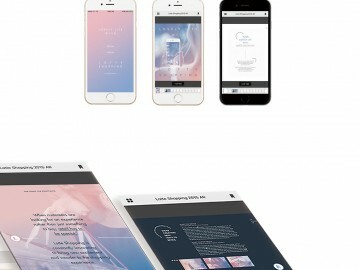 성과, 이슈, 계획, 그리고 담당자에 관한 정보를 한 눈에 알아볼 수 있도록 날개접지를 사용하여 정보 습득성을 높였습니다. 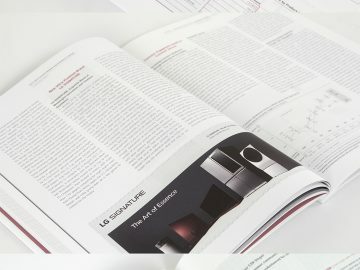 LONCHEL kuche 카다로그는 오스트리아에서 생산된 주방가구를 한국의 VVIP를 대상으로 마케팅하는 커뮤니케이션 툴입니다. 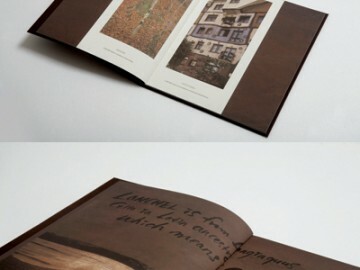 ‘art as a masterpiece’라는 컨셉 하에 전체적으로 묵직하고 고급감 있으면서도 심플하게 표현하고자 했습니다. 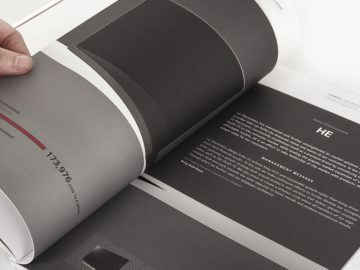 또한 브랜드 아이덴티티를 잘 표현해 줄 수 있는 브라운 컬러를 메인으로 하면서 블랙과 골드 컬러로 고급스러운 tone & manner을 구현했습니다.